Work continues on the King Knight campaign. Shovel Knight might be finished, but it's not finished finished, on account of the extra campaigns promised in Yacht Club's Kickstarter. We've already contracted Plague Knight, and we're still waiting to pick up the cloak and scythe of Specter Knight, and put on the shiny gold armour of King Knight too. As with Plague of Shadows, the two upcoming story campaigns will be entirely free for owners of the game, and now we finally know when one of them is going to release. Shovel Knight: Specter of Torment will be out Spring 2017, as revealed on Twitter by developer Yacht Club Games. 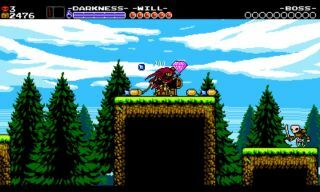 It swaps the steadfast Shovel Knight for the spooky Specter Knight, while bunging in new story elements and adding an extra mode; you can read all about it, and the King Knight campaign, here. Work continues on that campaign (Yacht Club is working on both simultaneously), but Specter of Torment will be out first. It will include either the new Body Swap or Battle Mode, the latter being a single-screen multiplayer combat minigame.